Abstract: Deciphering the evolution of Southern Ocean circulation during the Eocene and Oligocene has important implications for understanding the development of the Antarctic Circumpolar Current and transition to Earth’s “icehouse” climate. To better understand ocean circulation patterns in the Indian Ocean sector of the Southern Ocean, we generated a new fossil fish tooth neodymium isotope record (εNd) from the upper Eocene to upper Oligocene sections (36–23 Ma) of Ocean Drilling Program Sites 744 and 748 (Kerguelen Plateau, Indian Ocean). Reconstructed seawater εNd values from fossil fish teeth are used to trace changes in water masses across ocean basins. The records from Site 748 and Site 744 reveal a gradual shift from εNd values around 6.5 to 7.5 in the late Eocene to εNd values between 7.5 and 8.3 by the late Oligocene, consistent with a Circumpolar Deep Water (CDW) influence at the Kerguelen Plateau throughout the Oligocene. 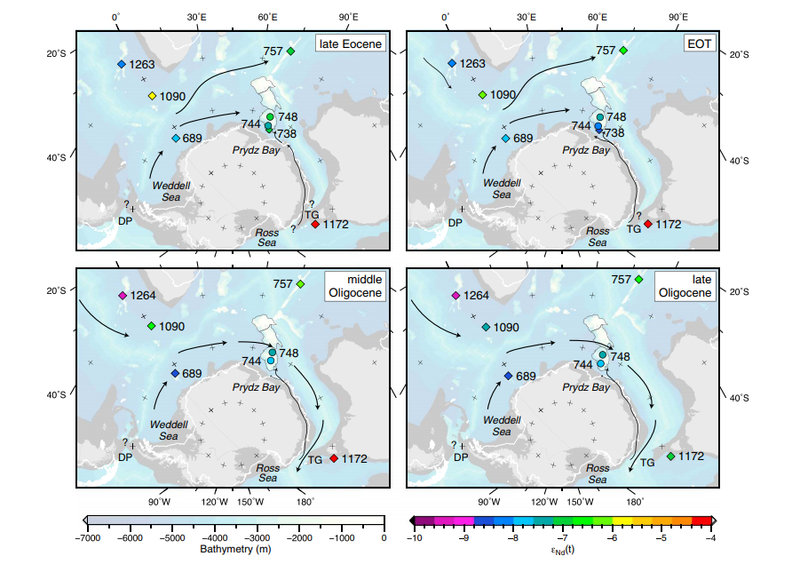 We interpret the shift to less radiogenic values to reflect the increased export of Northern Component Water to the Southern Ocean, likely into the proto-CDW. However, the records show no major change in water mass composition around the Kerguelen Plateau that would accompany an increase in Pacific throughflow related to the opening of Drake Passage and imply that Pacific throughflow via the Drake Passage occurred by the late Eocene. High-frequency variability in ɛNd values at Site 744 is interpreted as an imprint of Oligocene glacial activity, with a particularly pronounced excursion at 32.6 Ma roughly coinciding with other glacial weathering indicators around Antarctica. Figure 5. Schematic of water transport pathways from the late Eocene (~36–34 Ma), EOT (33.9–33.5 Ma), middle Oligocene (31–27 Ma), and late Oligocene (25–23 Ma), based on Nd isotope data only. ODP sites are colored based on their average εNd(t) value for each period considered (see supporting information). Plate tectonic reconstructions are based on Müller et al. (2016), with paleobathymetry derived using the method outlined in Müller et al. (2008). Present-day coastlines (white line), the reconstructed position of the present-day coastlines (solid light gray), and regions of nonoceanic crust (e.g., continental shelves) (dark gray) are also shown. The paleoposition of the Kerguelen Plateau is shown as a gray outline.